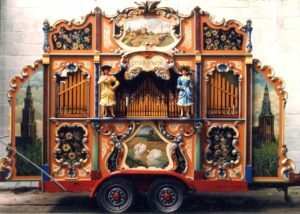 In the last forty years, we have worked on a wide variety of instruments, from tiny chamber barrel organs with as few as 14 pipes, to vast fairground organs containing almost a thousand pipes in all shapes and sizes. We have also restored clockwork and weight-driven barrel pianos and orchestrions, as well as larger barrel and roll-playing (piano) orchestrions. (Click images to enlarge). 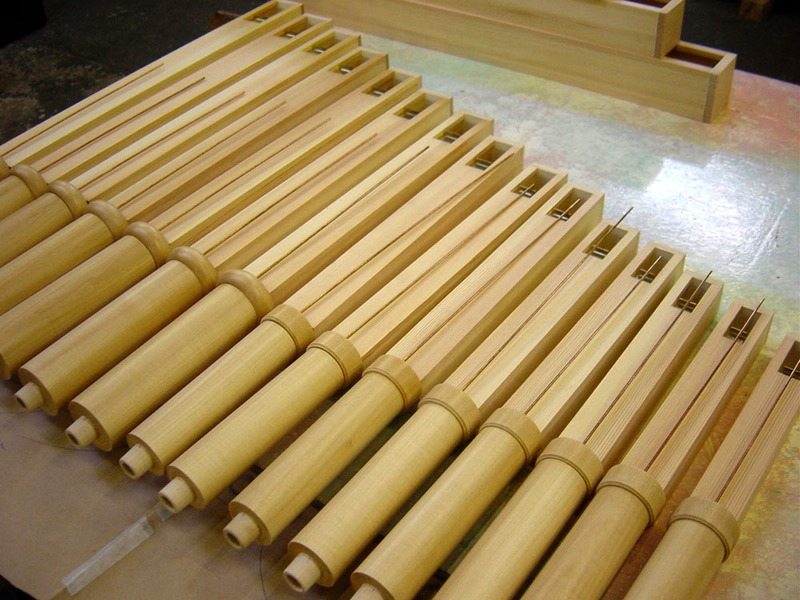 A 57 key Gavioli organ required a complete new rank of saxophone pipes to replace the original set which had been removed from the organ years before. The new pipes were made to Gavioli dimensions and provided with turned wooden boots, just like the originals. They are seen here without any external finish. 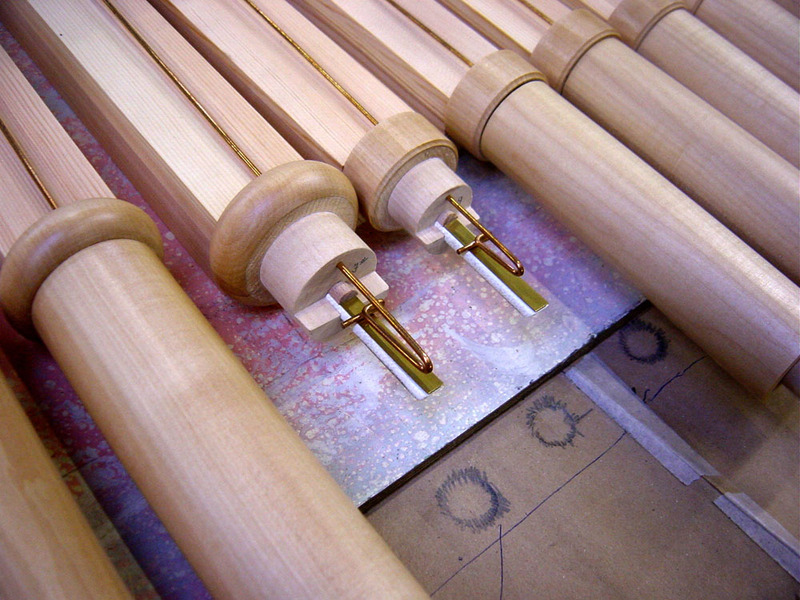 This photograph shows two of the reed assemblies in further detail. Note the high quality materials used, and the very high standard of manufacture. 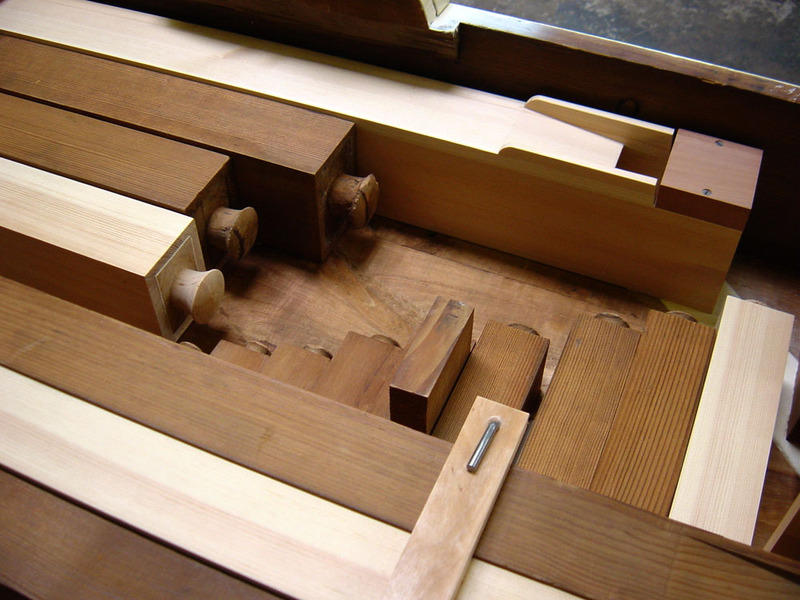 Thorough and careful recording of pipe scales, chest designs and dimensions, actions and other components by Russell Wattam during past restorations often enables missing parts to be authentically duplicated on other similar instruments where these parts are missing or damaged. This does not merely extend to the physical dimensions but also the very substance of an organ, the sound. This intangible element cannot be measured and reproduced without the fine ear of an experienced pipe voicer. 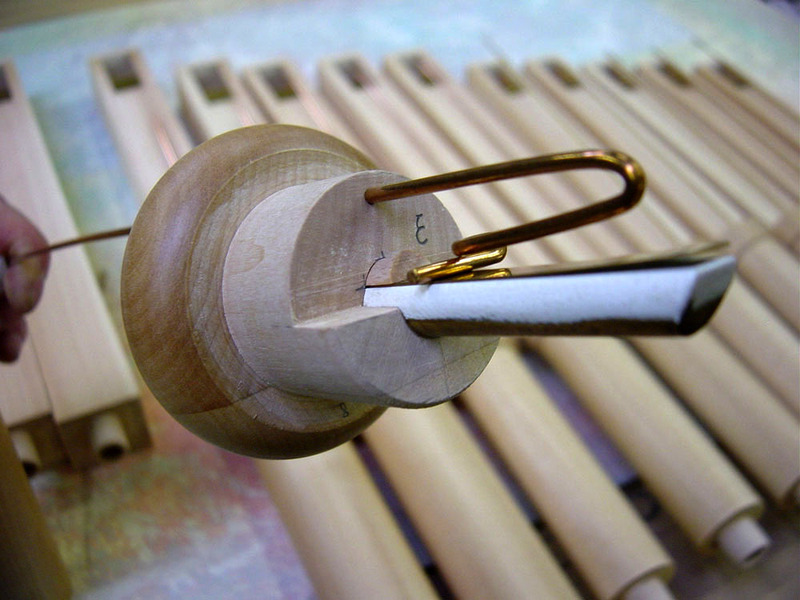 A closer look at the reed assembly of one of the replacement Gavioli saxophone pipes. Note the turned wooden block, leathered shallot and carefully made and curved brass reed (or tongue.) Correct scaling and accurate manufacture both contribute to tuning stability. In restoring old pipework, it is very easy to lose the original sound by careless work, incorrect wind pressures and wrong pitch. Our goal is to try to retain as far as is possible the original sound given to the organ by its original builder. Thus a Limonaire should not sound like a Gavioli organ, a Marenghi not like a Mortier and so on. This often involves making new pipes to the original scale, requiring the preparation of drawings and sometimes the sourcing of specific authentic materials. 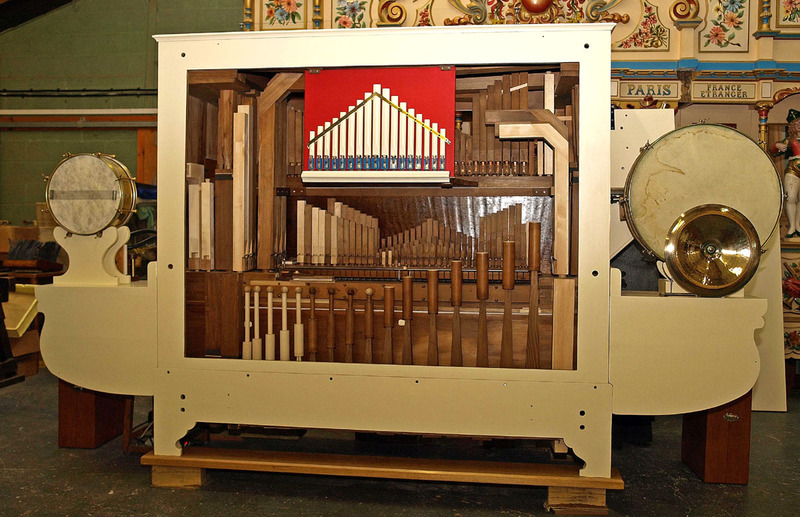 When an American organ company converted a model 36 Ruth organ to their own roll-playing system, they also removed all the pipes which were no longer required in the organ. We were commissioned to restore the organ and make it play on its original scale again, which necessitated replacing all the missing pipes. This photograph shows the pipes located beneath the floor of the organ case which were newly-made to the original dimensions. 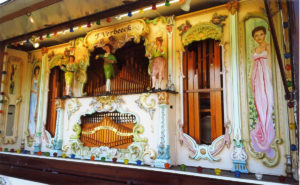 The photograph above shows the front side of the same organ, and shows the new pipes required to restore it to its original specification, including five new trumpets. All the new pipework was made exactly as the originals and voiced so that it is impossible to differentiate between the original and the new. 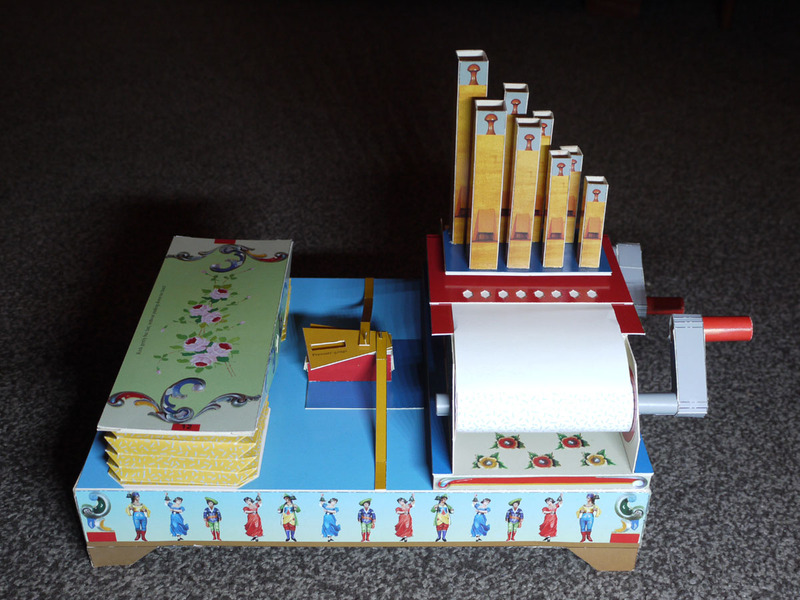 This work was carried out for a client in the United States and transformed the organ from an instrument playing on an unsuitable scale to one playing as the original makers intended, thereby reaching its full musical potential. (The photograph is used by courtesy of Keith Pritchett. © W. K. Pritchett). Some restorers offer good, new pipework at a competitive price, but made to suit almost all applications. Naturally such pipework can be semi-mass produced, being always the same, and can be sold at a significantly lower price, but will not sound quite like the originals did. We like to think that the extra cost of our new custom pipework is well justified when the result is heard in the finished organ.